Color Club Charity Ball is part of the Rebel Debutante collection from the spring of 2010. 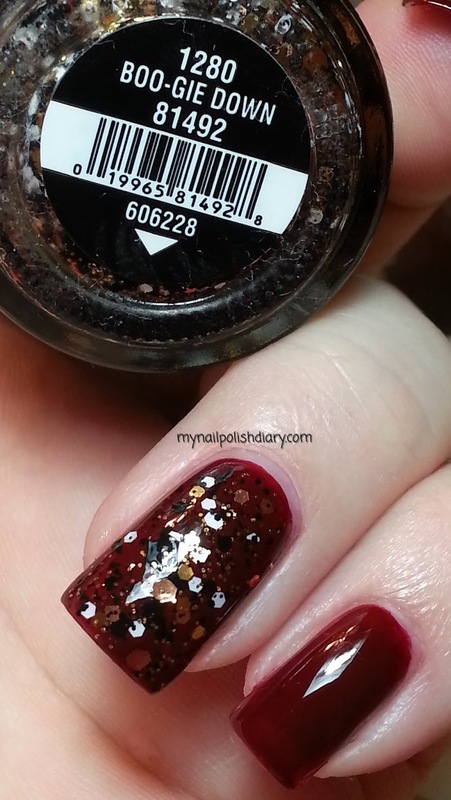 China Glaze Boo-Gie Down was released this Halloween in the Monster's Ball collection. 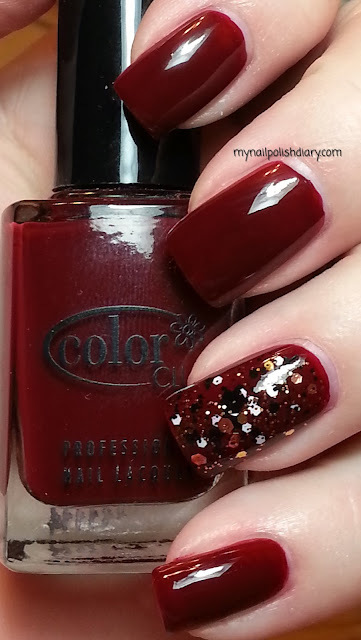 Color Club Charity Ball is a red based brown creme. I don't think I really like this shade of brown. I have a few of them and every time I wear them I'm like ehh. It's shiny and pretty and all, it's just not my thing. As for application and wear, though, I have to say it was really good on both counts. No complaints on this polish formula. It's great. Just not in love with the color. This might go into my purge box. For the accent nail I thought China Glaze Boo-Gie Down would look nice. I was right! It really goes well with the color. The gold hex and micro glitter really pops, as does the white! I had to thin it before I could use it. I applied it to my accent nail and it just destroyed the semi dry nail so I had to totally re-do the nail. Frustrating! I think I just got a bad bottle though. I noticed on the outside of the bottle the polish looked like it had leaked a little but wasn't shiny. Not sure when it happened but it was before I bought it. Once I added some thinner it applied perfectly. This might also be why I am not loving Charity Ball. Maybe I'm just having hard feelings cause the mani got messed up haha. In the end, I think this looks really good for fall.